It is very rare these days to find a book about a devastating diagnosis that is caring and healing. The reason this book is such a special and much needed book is because the authors Elisha Daniels and Kelley Tuthill went through cancer and recovered fully. They believe if they could beat this disease you can too. So they encourage a positive attitude and explain the importance of positive affirmations. They also cover topics like what to tell your children and spouse about your disease. As far as work goes you may not want to tell your diagnosis to certain people who will just make work more difficult for you. As far as insurance goes the authors explain how you should get your surgery and hospital stay preaproved so you must talk to your insurance company as soon as possible so you don't get huge unexpected bills. Now since this book is written by breast cancer survivors they really cover everything from surgery, reconstruction, chemotherapy and radiation. They even advise you briefly on some remedies for nausea. There are some beautiful moments in this book like the story of a husband who shaves his head to support his wife's hair falling out. He sent the message that they were in this together. The authors do encourage you to get as much help emotionally and physically to deal with your situation. They also encourage you to do fun things like going to a spa or getting your nails done professionally. I was happy that finally someone out there is talking about the link between alcohol and breast cancer. Now and then you come across a book that is extremely helpful and visually appealing. Jean E. Sprengel originally wrote this book for her sister after it was discovered that her cancer had spread to her liver. This book was meant to help her sister become more aware of things she could expect. I feel this book is especially thoughtful and caring. It also has good tips on dental health, how to shop for wigs and what to do about pain management. What I thought was especially useful was the list of what to put in a "chemo bag." This book also gives tips on what to do to make yourself feel better when dealing with side effects of chemo. I felt this book had the best advice on what to do about hair loss. 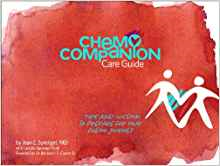 To me, this book is perfect to keep in your "chemo bag" for easy reference. There were many things in this book I had not considered and I've read many books on cancer. This is the best book I've ever read on how to manage side effects from chemo. 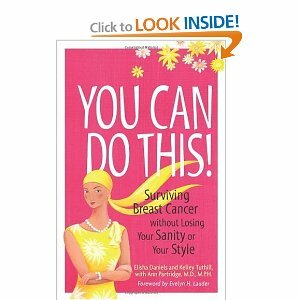 If you are going through chemo soon or have a friend or relative who is this book is essential reading. I received one free book for review purposes. 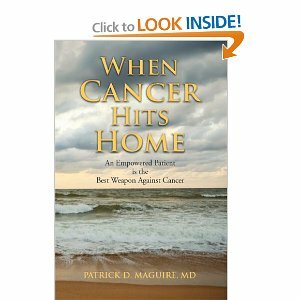 Patrick Maguire has written a comprehensive guide about cancer treatment options. He guides you through the 20 most common types of cancer that include: bladder cancer, brain tumors, breast cancer, colorectal cancer, esophageal cancer, head and neck cancer, kidney cancer, leukemia, liver cancer, lung cancer, lymphoma, melanoma, myeloma, ovarian cancer, pancreatic cancer, skin cancer, stomach cancer, thyroid cancer and uterine cancer. Each chapter has a story which makes this very personal. Since cancer is killing 600,000 people a year this book is very needed. Now this is not only a book for people who have cancer it is also good to read to help prevent cancer in the first place. Like I didn't realize that viruses could cause cancer. Women who are worried about breast cancer will also appreciate the section on how exercise can work in their favor. There are also many options once you have been diagnosed. Do you want surgery, radiation therapy, chemotherapy, hormonal therapy or immunotherapy? Since my father struggled with Esophageal cancer that specific chapter interested me. Then I also wanted to know about lung cancer since his cancer started to spread to other areas of his body. This book explains how you can put yourself at risk for esophageal cancer if you eat very hot foods or drinks. For those who don't have cancer I'd recommend reading the entire book as a preventative measure. For those who have been diagnosed then it is easy to read this book selectively, just reading the chapters with information on your condition. I think this book would also be helpful for doctors and nurses caring for cancer patients. A diagnosis of cancer is terrifying for most people but it doesn't have to be a death sentence. 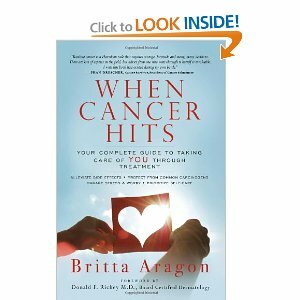 Britta Aragon is a cancer survivor so she knows what to expects and how to guide you through treatment and recovery. She explains how to deal with side effects from chemotherapy and radiation. There are many comforting ideas like putting oatmeal in your bath or putting nutmeg and cardamom in warm milk to help deal with nausea. She also recommends aloe gel and manuka honey for radiation burns. There are some good ideas like massaging itchy skin with ice cubes or making a banana and honey skin care mask. There are also many solution for mouth sores and some good tips on how to care for your hair during recovery. Along with all the health tips, the author also believes in saying affirmations and encourages the reader to see alternative therapies as needed. She believes there is always a solution to problems and pain and gives some folk remedies as well. So if you are going through cancer treatment I can't think of a better book to start with. Britta Aragon seems like a very caring person and her ideas will bring you comfort and reassurance that things will get better one day. Her main idea is that you start to really care for yourself in a loving way and this brings healing.